I sewed these pacifier clips for a baby shower this weekend. I'd noticed solid-color clips in the store while wandering the aisles, and I wanted to include something handmade in my gift. These seemed easier to make than a stroller. Here's my little tutorial. You'll need ribbon, suspender clips (available at fabric stores), Fray Check (optional), and velcro. 2. Apply Fray Check to each end to prevent unraveling. 3. Fold the ribbon in half, leaving a little extra at one end to fold over the other unfinished end to hide it. 4. 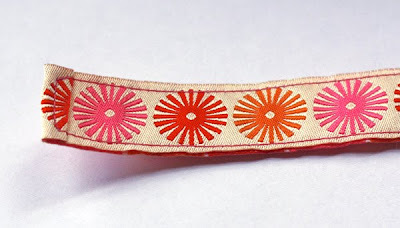 Stitch around the edges of the doubled ribbon , trying desperately not to run off the edge. Squeaking "Eeek!" helps a little when you get close. Just a tip. 5. Sew velcro pieces onto the folded end about 2" apart. 6. Thread the opposite end through a suspender clip and sew it down. LOve it ! To sad that we are getting my daughter off her paci!! Need some friends to have babies so I can make some. thanks for sharing! I've been wanting to make these, and now I have no excuse not to! Thanks for the quick tutorial! Thank You! I have been looking everywhere for a good tutorial on how to make these. My son is 1 year and I think we have bought at least 20 binkies (which are ALL lost in our house now) and I need to keep track of them better and I don't want to buy the cheesy looking ones in stores. Can't wait till you get brave enough to try the stroller! BTW, your posts are showing up much faster in Google Reader now. Did you get on their case? I sent them some brownies. Nah, I didn't do anything. Great tutorial! Just a word of caution--You might want to skip the "fray check" in case it's got toxic chemicals in it. My son often preferred sucking on the ribbon rather than the pacifier itself. Sorry I haven't been by lately. "Easier to make than a stroller" HA! Very cute project. heehee...kidding, of course. that line cracked me up. Please, if you make these, adjust the length so the finished product is less than 6", safe enough for a baby. I bet you could make mitten clips this way, too! Cool, thanks! I was just saying I needed some of these after picking the "ba-ba" up off the floor at Costco, icky! Awesome! Great gift idea for a baby coming up. Thanks for the tutorial! Those are ribbons I designed. You can get houses here at Fat Quarter Shop. I think the fireworks one is sold out everywhere. what a combi! I'll keep in mind as a present. In a pinch, clear nail polish works okay instead of Fray Check. your post made me laugh. specifically the part about these being easier to make than a stroller. handmade gifts are the best. I especially love making them for new parents. great idea. What a great idea. 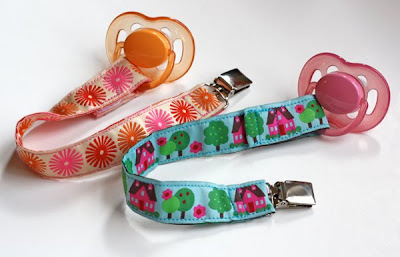 I think these pacifier clips with ribbon would make great holiday presents. I LOVE this tutorial. I paid $14 for mine at Target, and it wasn't nearly as cute! Great idea for a quick baby gift! I tried squeaking EEEK! but I still sewed off the end :-). "EEK" only works about 85% of the time. You must have landed in the 15% window where it didn't. Odds are in your favor for next time, though. Great tutorial. Directions are clear, pictures illustrate steps clearly, and you made them so simple to understand. I've made 3 now and can't wait to make more. Thanks for posting this. I made these to top a gift at a baby shower this weekend - they were a huge hit! They prompted a conversation about how pacifier clips are perfect for just about everything when your baby is going through the "throw things on the floor and watch mom pick them up" phase. Thanks for the easy tutorial and gift idea! lovely! can you please tell us where you found the wonderful orange and pink starburst ribbon? I designed these, but I think the Fireworks ribbon must be sold out from the retailers I knew had it... I don't see it anywhere now. Sorry! I can't take my eyes off that pretty ribbon you used withthe houses. No chance you remember where you purchased it or how I could get my hands on even a yard of it huh? Great work! Hi Mindy, thanks for the compliment. I designed the houses ribbon for J. Caroline Designs. You can buy some at Fat Quarter Shop, right here. You can see another photo of it on my ribbons page. I wonder how much these would sell for at a craft show?